Leopard’s version of iCal gets some nice new editing tools and a clean new look. But the biggest news is that OS X’s calendar built-in app now supports group-scheduling—provided you have access to the right server software. 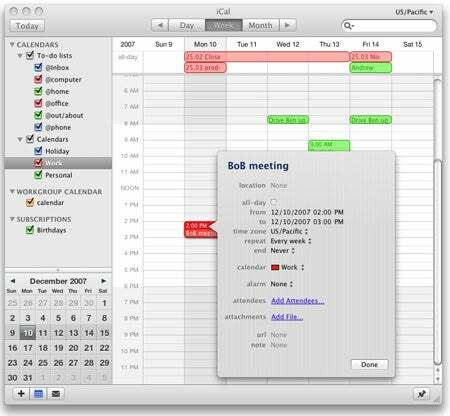 The group scheduling changes to iCal were first disclosed when Apple took the wraps off of its OS X 10.5 plans in August 2006. To recap what we knew back then, iCal in Leopard was supposed to let other iCal users edit calendars you created. Other advertised group features were the ability to automatically check other iCal calendars to find times when everyone was free and to create drop boxes for events to share relevant documents. We know a lot more about how this works now that Leopard has shipped. Let’s say you’re scheduling a meeting. After you fill in the attendees list, you can press Shift-Command-A to call up an Availability window, which will show you when invitees are free. That same window has a Next Available Time button; click that, and iCal will find the next slot that works for everyone on your list. The only catch: To make group-scheduling work, you need to be running the right server software on your network. “Right” means “compliant with the CalDAV calendaring standard.” Not surprisingly, the new version of OS X Server (also known as Leopard Server ) is. There are several other CalDAV servers out there; unfortunately, though Microsoft recently joined the CalDAV consortium, Exchange isn’t (yet) one of them. Another expected change in iCal was a retooled interface. The shipping version is visually much more consistent with the rest of OS X 10.5. Brushed-metal gives way to solid gray. The frames separating the calendar list from the main calendar itself are gone. The search field moves from the center bottom to the upper right, where all search fields belong. The changes aren’t just cosmetic: The iCal sidebar, for example, gets new subsections for subscribed and workgroup calendars, making it feel more organized. Besides the Leopard-style interface, the latest version of iCal adds other features like the ability to add attachments to an event invitation. Apple told everyone to expect the Leopard-style makeover at this June’s Worldwide Developers Conference. Less publicized were changes to iCal’s editing interface. In the previous version of iCal, when you wanted to change the details of an appointment, you selected the appointment, which caused an editing window to slide out of iCal’s side. In the new iCal, double-clicking an appointment causes an inspector box to pop up right next to the appointment itself; to edit appointment details, you click an Edit button in that inspector box. (You can also select the appointment and hit Command-E.) That might seem like one click too many to some users; some might also object to the fact that the inspector box obscures part of the calendar. But, overall, the new editing interface is consistent with iCal’s cleaner new look. While iCal’s new group scheduling tools are welcome, there is that catch: The added capabilities only work if there’s a CalDAV server somewhere on your LAN. If your shop is already running OS X Server, an upgrade to the Leopard version of same will give you and co-workers all these nifty group tools. But if you don’t have access to the latest OS X Server (or some other CalDAV-compliant program), iCal 3.0 amounts to a nice, but relatively minor interface-lift. The interface tweaks will make iCal a welcome upgrade for any of its current loyalists, but won’t be enough to convince anyone to switch. If you’re in an office where you can convince your IT folks to switch to OS X Server or some other CalDAV-compliant calendaring platform, its group scheduling tools would be great for any small business or workgroup. Great or Wait? To get the most out of this new version, you—or more likely, your IT folks—will need to implement CalDAV. Assuming that’s the case— Wait.